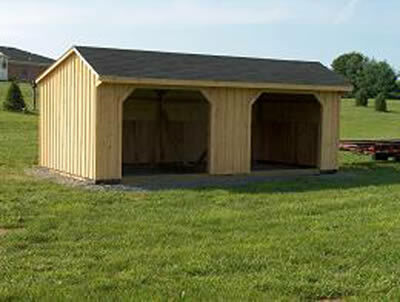 Groffdale Barns is committed to providing you with quality run-in sheds, custom-built to your specifications. From the Oak Framing and Braces to the White Pine Vertical Board & Batten Siding, we build each detail with superior quality and class. 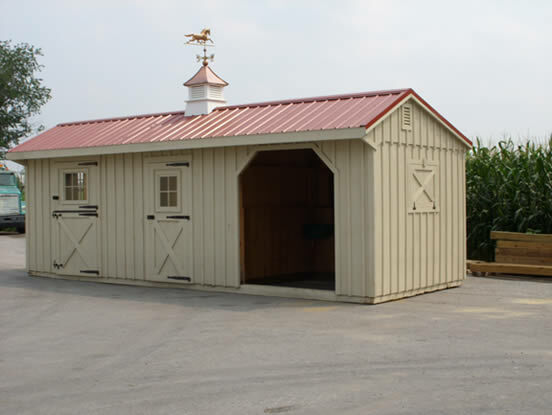 Each of our portable run-in equestrian shed buildings are pre-constructed at Groffdale Barns and then delivered and installed at your location. With over 35 years of experience you can expect excellent craftsmanship and outstanding durability. I normally abstain from endorsing any product or work that I have had done; however, in the case of Groffdale Barns I want anyone interested in having a barn built to know that after extensive research and meeting with numerous barn builders in Virginia and making a trip to Groffdale Barns I decided that Groffdale was the barn builder for me. I want to attest to the professionalism, quality, and workmanship which couldn’t be equaled by any other barn builder that I researched (in my opinion).